Parking: adjacent dirt parking lot, mostly under trees. Facilities: Restrooms, picnic tables, camping. Security: We were told by locals that this is a relatively secure location to leave unattended vehicles. Shuttle: We dropped boats and passengers at Brownville Park, then left the cars at the Exit in Arcadia. 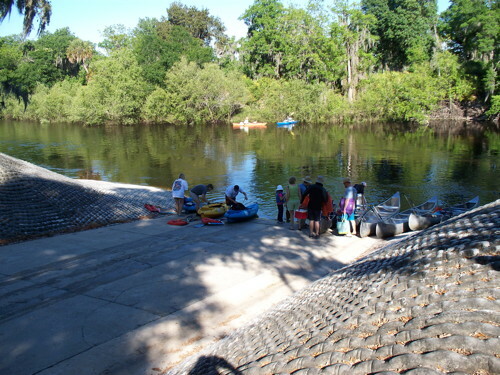 We called in advance to have Zamora's Taxi (863-494-1582) take the drivers back up to Brownville Park to start the day. Zamora's Taxi was reliable and friendly. Directions: From downtown Arcadia, drive west on SR 70 about 1.5 miles to the bridge. Description: Cement boat ramp and adjacent grass beach. Beware that the ramp was located in an area of high river current (see the turbulent water in front of the rocks in the photo). 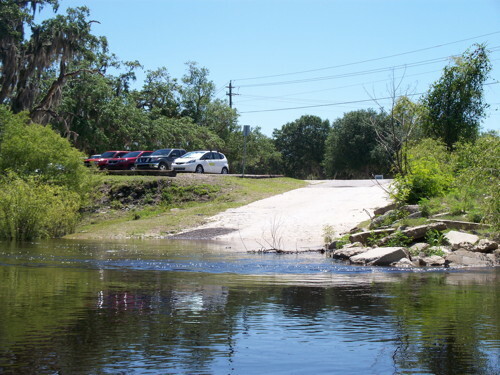 So we took out on the grassy beach beside the cement ramp, just downstream, where there was less current. Security: We were told by locals that this is a relatively secure location to leave unattended vehicles. This was where we left our vehicles. We waited for a large group of rental canoes to leave, then launched and quickly left them behind. The beginning section had wooded banks. 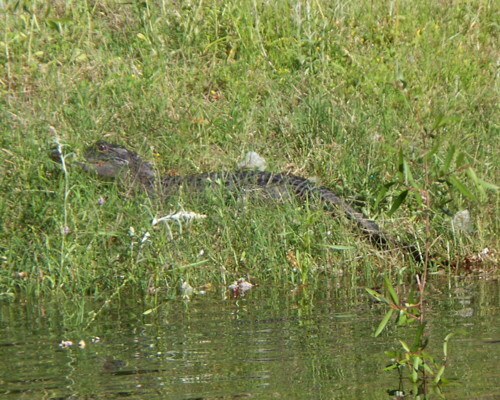 We saw a few small alligators warming themselves in the sun on a beautiful day. 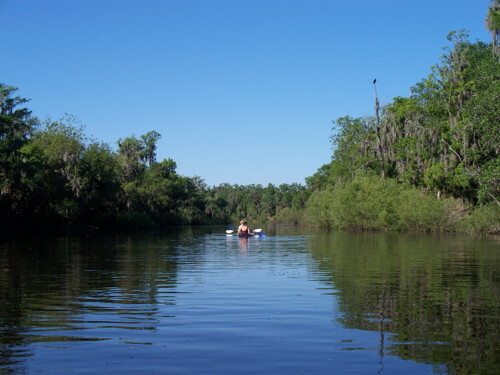 Unlike over 20 shy, larger alligators we saw kayaking from Zolfo Springs to Gardner the day before, we were able to get close enough to take a picture before these swam into the water to hide. Kayaking further downstream, we saw some houses and cabins along the shore. 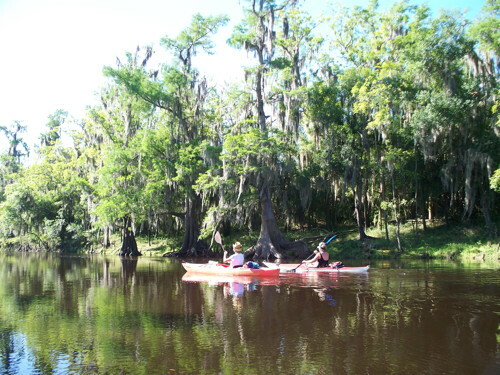 And we paddled along beautiful, large cypress trees hanging with Spanish Moss. Because it was warm, we tried to paddle in the shade of this splendid canopy of trees wherever we could. We found a nice sandy beach on the outside of a bend in the river to dig for fossils. Though the water level was higher than optimum for finding fossils, we found several shark teeth in just a few minutes of amateur digging. 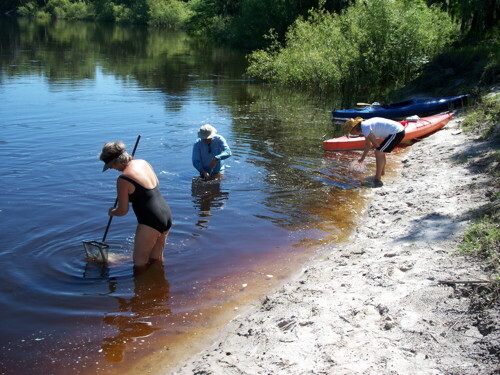 We were using a sand flea scoop to filter the larger pieces from the bottom sediment we washed away in the river. 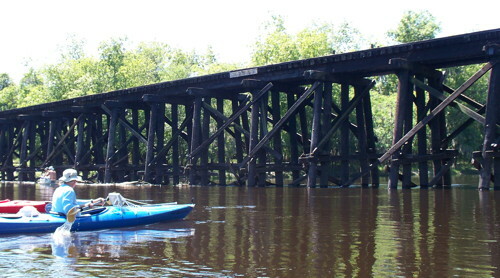 When we saw the railroad bridge, we knew we just had one more mile (line of sight to travel) or about 2 miles of paddling. Kayaking farther downstream, we saw many tents pitched by campers along the river with car access behind them. And entering Arcadia, we saw some large homes on the river banks as well.